LANXESS India Private Limited’s Mr. Namitesh Roy Choudhary, Vice President – Industrial and Environmental Affairs & Capital Investment and Mr. Subhat Kumar Jindal, General Manager, Head of Manufacturing, Nagda site, accepted the ICC award for Water Resource Management, presented by Mr. Ananth Kumar, Hon’ble Minister for Chemicals & Fertilizers, Government of India and Padma Vibhushan Dr. Anil Kakodkar, Former Chairman, Atomic Energy Commission of India. Mumbai, September 30, 2014: LANXESS India Private Limited, a fully owned subsidiary of LANXESS AG, a global specialty chemicals company, has been acknowledged for its exceptional work in the area of water resource management. The company has been systematically pursuing an integrated water management strategy at its manufacturing site in Nagda, Madhya Pradesh and has been working towards ‘zero discharge’ goal which has been accomplished through the Waste Water Post Treatment Plant. The award for Water Resource Management in Chemical Industry was handed over to Mr. Namitesh Roy Choudhary, Vice President – Industrial and Environmental Affairs & Capital Investment and Mr. Subhat Kumar Jindal, General Manager, Head of Manufacturing, Nagda site, LANXESS India Private Limited, in appreciation of the company’s perseverant efforts towards meeting very high water resource management standards at its manufacturing site in Nagda. 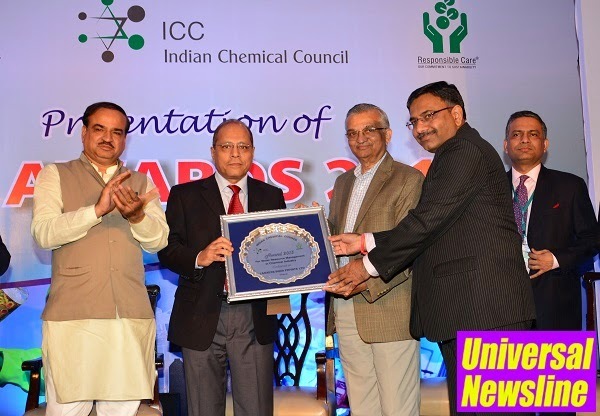 Mr. Ananth Kumar, Hon’ble Minister for Chemicals & Fertilizers, Government of India and Padma Vibhushan Dr. Anil Kakodkar, Former Chairman, Atomic Energy Commission of India, handed over the award to Namitesh Roy Choudhury and Subhat Kumar Jindal, in the presence of other dignitaries from the chemical industry at a gala event. The LANXESS site at Nagda already had a full-fledged effluent treatment plant (ETP) and a state-of-the-art sewage treatment plant which treated sewage water from the colonies around and rendered it fit for use in the production processes. After a reverse osmosis step, this water was then used as boiler feed water. Taking another step towards sustainability, LANXESS evaluated how the entire treated waste water could be recycled. Thus was born the concept of the waste water post treatment plant (WWPT). This plant, commissioned in November 2012, treats the discharge from the existing ETP in a manner that virtually no liquid effluents are discharged from the site to Chambal river. The water recovered from this plant is used for the production processes, which bridges the gap in availability of water during the summer months. Last year, LANXESS was also conferred “Excellence in management of Health, Safety and Environment” by ICC for the year 2012 because In the last years, LANXESS has made significant investments in upgrading this site in terms of health, safety and environment and for this WWPT plant too, it has used some of the best technologies available in the world and has partnered with some of the best known suppliers in this industry. All these initiatives has reduced the fresh water requirement of the plant to 1/8, which means, fresh water required to run the plant for one year before implementing these initiatives will now be sufficient for about 8 years.